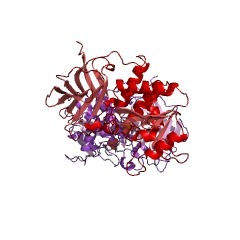 This is the C2 domain-like domain, in greek key form, of the PTEN protein, phosphatidyl-inositol triphosphate phosphatase, and it is the C-terminus. 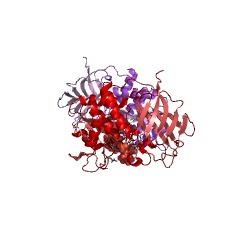 This domain may well include a CBR3 loop which means it plays a central role in membrane binding. 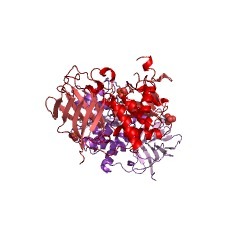 This domain associates across an extensive interface with the N-terminal phosphatase domain DSPc (Pfam PF00782) suggesting that the C2 domain productively positions the catalytic part of the protein onto the membrane (PMID:10555148). 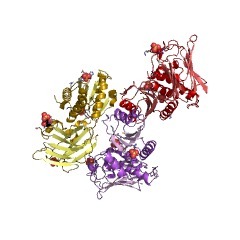 Tensins constitute an eukaryotic family of lipid phosphatases that are defined by the presence of two adjacent domains: a lipid phosphatase domain and a C2-like domain. 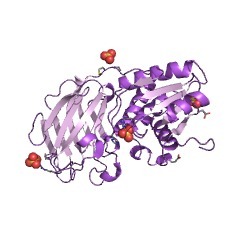 The tensin-type C2 domain has a structure similar to the classical C2 domain (see IPR000008) that mediates the Ca2+-dependent membrane recruitment of several signalling proteins. However the tensin-type C2 domain lacks two of the three conserved loops that bind Ca2+, and in this respect it is similar to the C2 domains of PKC-type [(PUBMED:11395408), (PUBMED:11858936)]. The tensin-type C2 domain can bind phopholipid membranes in a Ca2+ independent manner [(PUBMED:10555148)]. 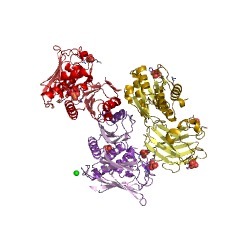 In the tumour suppressor protein PTEN, the best characterised member of the family, the lipid phosphatase domain was shown to specifically dephosphorylate the D3 position of the inositol ring of the lipid second messenger, phosphatydilinositol-3-4-5-triphosphate (PIP3). 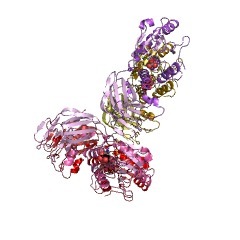 The lipid phosphatase domain contains the signature motif HCXXGXXR present in the active sites of protein tyrosine phosphatases (PTPs) and dual specificity phosphatases (DSPs). Furthermore, two invariant lysines are found only in the tensin-type phosphatase motif (HCKXGKXR) and are suspected to interact with the phosphate group at position D1 and D5 of the inositol ring [(PUBMED:11395408), (PUBMED:10555148)]. 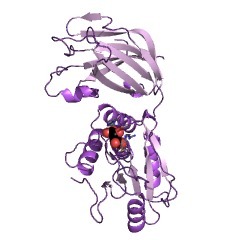 The C2 domain is found at the C terminus of the tumour suppressor protein PTEN (phosphatidyl-inositol triphosphate phosphatase). 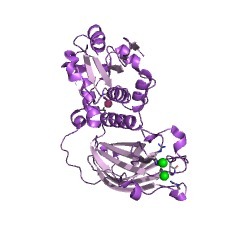 This domain may include a CBR3 loop, indicating a central role in membrane binding. 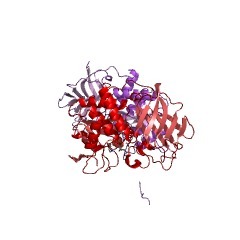 This domain associates across an extensive interface with the N-terminal phosphatase domain DSPc suggesting that the C2 domain productively positions the catalytic part of the protein on the membrane. 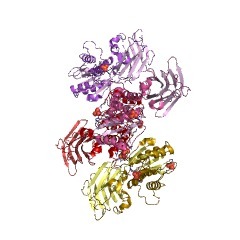 The crystal structure of the PTEN tumour suppressor has been solved [(PUBMED:10555148)]. 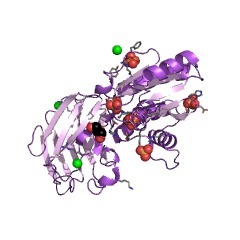 The lipid phosphatase domain has a structure similar to the dual specificity phosphatase (see IPR000387). However, PTEN has a larger active site pocket that could be important to accommodate PI(3,4,5)P3. Tensin, a focal-adhesion molecule that binds to actin filaments. It may be involved in cell migration, cartilage development and in linking signal transduction pathways to the cytoskeleton. 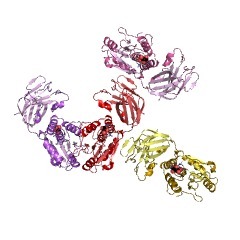 Phosphatase and tensin homologue deleted on chromosome 10 protein (PTEN). It antagonizes PI 3-kinase signalling by dephosphorylating the 3-position of the inositol ring of PI(3,4,5)P3 and thus inactivates downstream signalling. It plays major roles both during development and in the adult to control cell size, growth, and survival. Auxilin. 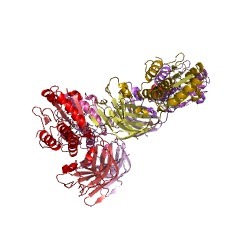 It binds clathrin heavy chain and promotes its assembly into regular cages. 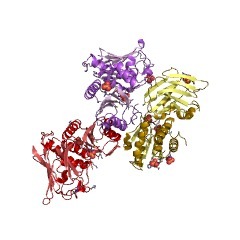 Cyclin G-associated kinase or auxilin-2. It is a potential regulator of clathrin-mediated membrane trafficking. There are 6056 PTEN_C2 domains in 6045 proteins in SMART's nrdb database. Taxonomic distribution of proteins containing PTEN_C2 domain. This tree includes only several representative species. The complete taxonomic breakdown of all proteins with PTEN_C2 domain is also avaliable. Click on the protein counts, or double click on taxonomic names to display all proteins containing PTEN_C2 domain in the selected taxonomic class.